K&N replacement air filters improve your pony's horsepower and acceleration with it's simple drop-in design. Fits 1987-1993 4 cylinder stock air box. Improves Horsepower. Now you can improve your 87-93 4-banger pony's performance with a K&N Drop-in Replacement Air Filter. Simply replace your stock restrictive paper air filter with a new high flow K&N air filter and feel an increase in horsepower and acceleration while still providing excellent filtration. Filters out harmful contaminants. The K&N Drop-in Air Filter filter's out harmful contaminants with it's unique layered design. K&N Air Filters are made up of layers of specially treated cotton gauze that are sandwiched between two epoxy-coated aluminum wire screens for durability. K&N uses a specially formulated grade of oil to treat the cotton gauze layers which causes a tackiness throughout the cotton's microscopic strands creating a powerful filtering media that ensures engine protection. Drop-In Replacement. 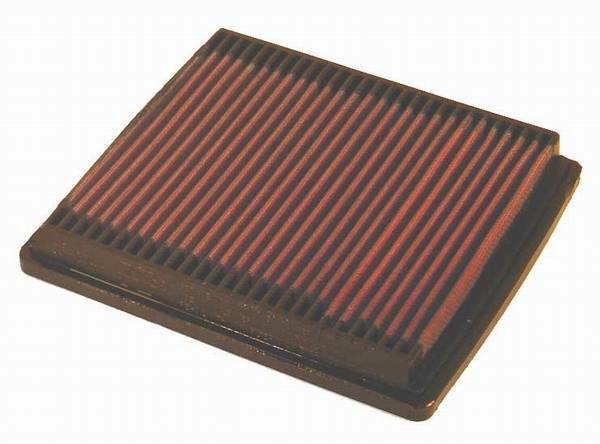 K&N designed this Air filter to be a direct drop-in replacement for the stock 1987-1993 4 cylinder Mustangs air box, no cutting or trimming required.